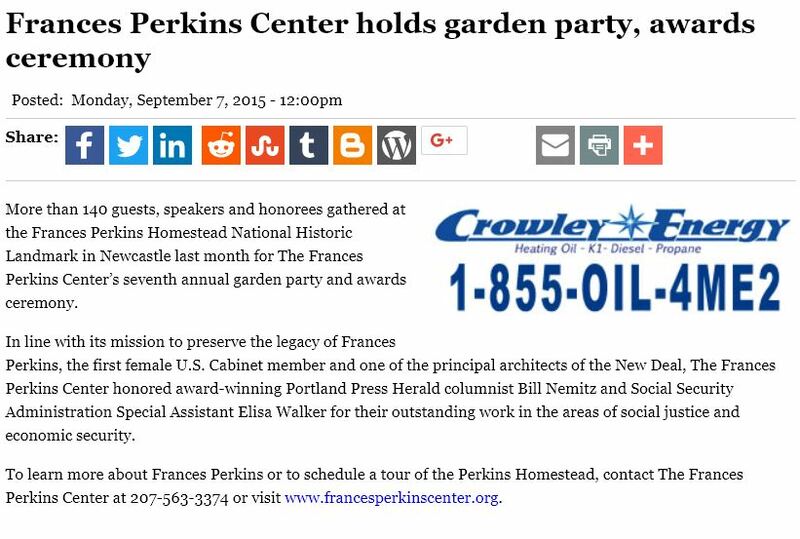 More than 140 guests, speakers and honorees gathered at the Frances Perkins Homestead National Historic Landmark in Newcastle last month for The Frances Perkins Center’s seventh annual garden party and awards ceremony. In line with its mission to preserve the legacy of Frances Perkins, the first female U.S. Cabinet member and one of the principal architects of the New Deal, The Frances Perkins Center honored award-winning Portland Press Herald columnist Bill Nemitz and Social Security Administration Special Assistant Elisa Walker for their outstanding work in the areas of social justice and economic security. To learn more about Frances Perkins or to schedule a tour of the Perkins Homestead, contact The Frances Perkins Center at 207-563-3374 or visit www.francesperkinscenter.org.